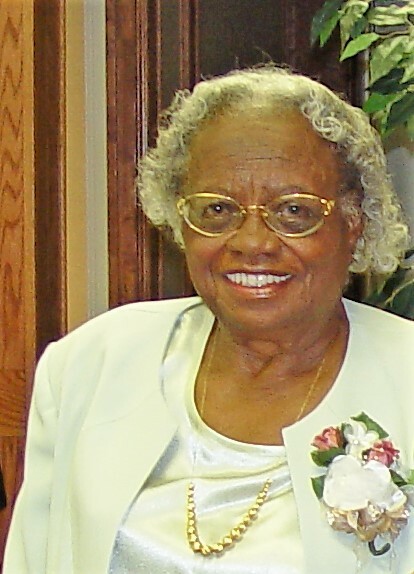 Obituary for Bernice Mae (Gee) Williams "Madear" | Dixon Funeral Home, Inc.
Bernice Mae (Gee) Williams "Madear"
Funeral services for Bernice Mae Williams, 99, of Brazoria will be Saturday, November 17, 2018 at 12:00 p.m. at Greater Mount Zion Church in Brazoria with Dr. Karey E.L. Gee eulogizing and Rev. Kenneth W. Bree officiating. Burial will follow at Shiloh Cemetery in Cedar Lane, TX. She passed away on Sunday, November 11, 2018 at Park Manor of Quail Valley in Missouri City, TX. She was a lifelong member of Bethlehem Christian Church where she served on the Pastor’s Aide Committee, Homecoming Committee and Usher Board. She was Parliamentarian for Texas Women’s Disciples of Christ and Prayer Leader for The Christian Women Fellowship. She was a Licensed Beautician. Her hobbies were gardening, barbecuing and fishing. She enjoyed spending quality time with her family and friends. She was preceded in death by her husband; Barney Williams, Jr.; parents, Edward and Estella Gee; son, David Charles Williams; brothers, Edward W. Gee, Samuel H. Gee, Eddie Gee and Ferlando Gee; sisters, Pearl Ree Edison, Versie Gee and Dorothy Walton; great granddaughter, Chloe Williams; grandparents, Karey and Rebecca Gee and sister-in-law, Patricia Gee. She leaves to cherish her precious memories; sons, Samuel J. Williams (Maurline), Brazoria and Barney D. Williams (Katherine), Sugarland; daughter, Marilyn L. Breedlove (Stephon), Houston; sisters, Esther Gee, Missouri City, Judy Gee and Frankie Gee both of Houston; brothers, Dr. Karey E.L. Gee, Jacksonville, Florida, Franklin D.R. Gee (Vivian), Round Rock and Wilson Gee, Houston; good friends, Lola Mack, Brazoria, Carrie Green, Cedar Lane and Florida Bonner Jones, Rosharon; 8 grandchildren, 8 great grandchildren and a host of nieces and nephews, other relatives and friends. Active pallbearers will be DeJuan P. Williams, Michael A. Williams, Adrian R. Williams, Isaac D. Breedlove, Kelvin Mangum, Orrick Sidney and Warwick Woodard. Visitation with remarks will be Friday, November 16, 2018 from 5:00 p.m. to 7:00 p.m.at Bethlehem Christian Church in Cedar Lake, TX. There will be viewing on the day of the service at Greater Mount Zion Church from 11:00 a.m. to 12:00 p.m. There will be no viewing afterward.